Marsha Music at Women’s Day at Zion. One of my favorite gospel CDs is by BeBe Winans – called “Cherch”; spelled that way to capture the phonetic distinction that we make between Black and White “church” – or, even more specifically – between Black Sanctified/Holiness/Pentacostal/Church of God in Christ church, and the more formal, less demonstrative Black church services (that are actually diminishing in numbers these days, in favor of much more emotional “Praise and Worship”). BeBe’s CD comes on the heels of the late Bishop G.E. Patterson’s, “Singing the Old Time Way”, a 2 CD set followed by yet another “Singing The Old Time Way Part II” release, both favorites of mine. These efforts capture the music of the modern sanctified church, which is musically much the same as the old sanctified church – and that’s the point. Songs from the Sanctified Church have remained sort of hidden in plain sight within the gospel music world. This is not the music of the mass choir or even, in some respects, the dynamic solo. These songs, in the main, are congregational – someone “raises” a song and the church joins in, mostly simple phrases, repeated over and over. The essence of call and response. Often, several songs will have the exact same rhythm and tune, just different lyrics. In fact, the clarion song of most Black Holiness churches is called just plain “Yes”, with a series of instantly recognizable notes. This one word chant is sometimes jokingly called the national anthem of the COGIC. The lyrics consist of that one word, embellished by little more than cries, shouts, key changes, and embellishments of exhortions to praise, for as many stanzas as required by the collective spiritual consciousness – i.e. The Holy Spirit – of the church. Women’s Day – in white – at Zion. 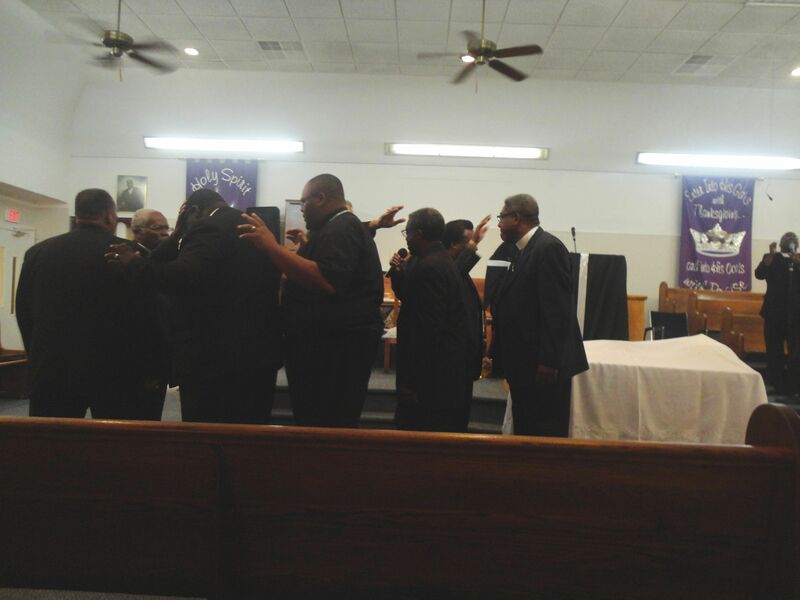 Many (especially white) music intellectuals do not know, or cannot make the distinction, that the gospel music of choirs and quartets and groups (like the Soul Stirrers or Mighty Clouds of Joy) was not the same as the music at regular church services, especially at a sanctified church. Much of the music of a Dorothy Love Coates, Clara Ward, or Wynona Carr – legendary Gospel singers – was not a part of the song list of congregational chants in Holiness church services. 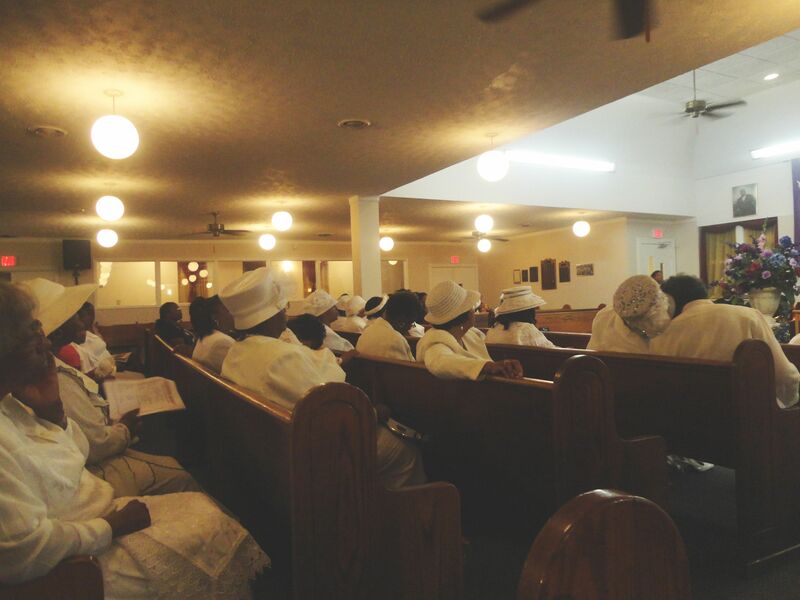 Much of such popular gospel music was viewed in Holiness churches as a sort of gospel entertainment, if you will, and as such often taken in careful doses, or reserved for after church edification. Such music was highly regarded but often reserved for church “Programs”, those special evening – after regular services – Gospel shows. This was not so much because of perceptions of “worldliness” – though that was often the case – but often because the solo or quartet/group formations tended to uphold or create individual “stars”, or distinquish themselves as individual self-contained groups, as opposed to the whole congregation – the collective body of singing believers. Be Be and the rest of the Winans were raised spend their early years at Zion Congregational COGIC, founded almost a century ago by their grandfather, the venerable Elder I. W. Winans. This now historic church is known in the COGIC world as “Mack Avenue”, after it moved on that street in the midst of the depression, just East of the Eastern Market in Detroit. 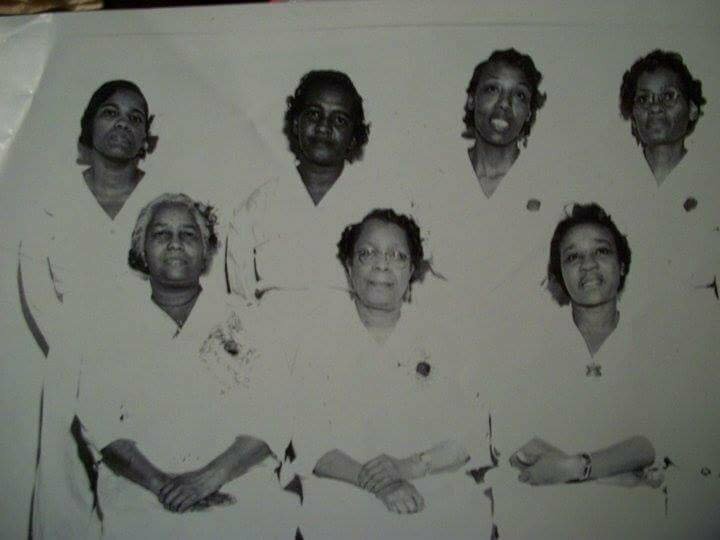 Mothers of Zion, circa Back in the Day; my grandmother front row, far left. It is my family church, too; my grandmother was a founding member, and our families sang and shouted together there down through the years. Bebe and the Winans and I are connected by many degrees of convoluted family/church ties. 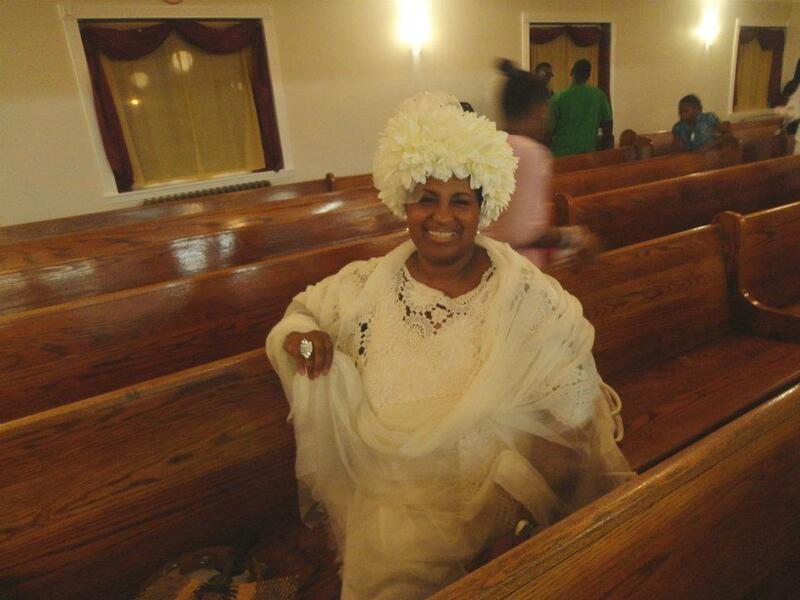 My grandmother – mother Baker – was the Godmother of Cede Winans, and the teacher of Sunday school – known in COGIC church as Sunshine Band, of all the Zion kids of that era. Church lore has it that a reason that the Winans left Zion church was that the efforts of “Pops” Winans to feature his gifted young sons and their singing group met with less than enthusiam – and even open disapproval. For a singing group – gospel or not – ran against the church’s culture of collective, congregational singing. So, the irony should not be lost that Bebe Winans, of the group that hurled gospel into the modern, post Motown era, has reached back into his traditional, congregational roots at Zion services. With “Cherch” he has made a CD with music that is closer to the real church services that I know, singing what we call the “old songs”. They are simple, sometimes stark, sometimes layered with rhythm and chords; the musicality shaped by the customary percussive weight common to Santified music – the tamborine, jangling guitar riffs; and the mythical Hammon B5 organ. This gospel music is so archetypal in form that one can sometimes hear how it morphed from the Holy Dance music to the secular – the “world’s” early R&B and Rock & Roll. These songs are reminiscent of Southern one-room churches in the South, and the old night-time services in Detroit, with the Saints running up and down the aisles (as, yes, I have myself done and will doubtless do again). It occurs to me in this writing that some of these songs – and those on Bishop G.E. Patterson’s CDs – are almost secret songs, lacking exposure to the mainstream record world, and I have a sense that down through the years there may have been a reluctance about releasing them as records, as if to do so would give up yet one more element of African-American spiritual power. For the commercialization of Gospel music is evidenced by our sacred musical forms performed as the background to everything from raunchy pop singers, to fried chicken and car ads – risking the dilution of its awesome power. BeBe’s tunes on “Cherch” are songs that, from the first note, resonate through a congregation and place it “on one accord”. His arrangements on a few are more contemporary, but he gets others spot on in “the old way”; they are the very definition of Old Time Religion. “He’s Got Better Things for You” is a sweet gospel confection, sang the same way that is was sung when I was a child sitting in the balcony at “Mack Ave”, hiding from my grandmother during services; and just the same way it is sung there today. The TV concert of the CD is great, one of those that we tape and show over and over on the holidays when company comes – especially the elders. There is a thrilling interlude with Israel Houghton, a major gospel talent who tends towards the Christian Rock genre, but here he has the bombastic, sweet chorded, beat-heavy edge that I love. Israel is a gifted singer and a presence of such substance and energy as to not only hold his own with Bebe, but elevates the song “I Love the Lord/So Good – He Has Been So Good To Me“ to its convocational, ecclesiastical ecstasy. In this duet with BeBe, Israel skips the saccharine and goes for pure Gospel sweetness; it’s on the CD as well, but not to as great effect as “seeing” the two of them on the DVD version that I saw on BET. Dionne Warwick, whom BeBe affectionately calls “Aunty”, makes a cameo appearance; and in a spontaneous duet reveals the gospel pipes that are at the base of the talents of she and her Houston kin, Cissyand the late Whitney. BeBe himself is a rousing singer with a beautiful voice; he eschews the Gospel roar for a mellifluous, joyous Holy singing, as close to classical chorale as to the Sanctified shout. His presence is one of the twinkling eye, straightened spine, and quick step of the Holy dance. One can hear the child-like pride in his voice when he refers to his father, the late Pop Winans (whom he looks very much like) and leads the singing on the old “Well Done (Thy Good and Faithful Servant)“. I catch the quick tears in his voice when he says, “That’s my father…..that’s my Daddy”. I sing in church now and again, and have come to understand the importance – or better yet, the gift – of raising just the right song at the right time – to comfort, to encourage, to help us pull onto “one accord“. BeBe Winan’s “Cherch” brings to my memory more songs for Sundays, from the days when his mother and mine and his grandmother and mine sang them at “Mack Avenue“. Folks often ask, “what happened to good singing?” in the Black community. It is not dead, it just went to “Cherch” – where all Black music at the end of its generation goes to be born again – as Gospel. Categories: Musin' on Music | Tags: cherch, gospel, winans | Permalink.